Ashiyana Yoga and Spa Retreat Village is located on the beautiful and unspoiled Mandrem Beach in the very north of Goa. Set amidst abundant, tropical flora and fauna, it has been designed as a deeply nurturing space where you can relax your body, calm your mind, and awaken to your inner peace of being. A Yoga Holiday allows you to be totally flexible with your time and yet attend any of the classes at the "Drop-in" centre. Since our focus is not so much on style of yoga, but rather the sensitivity and awareness with which our teachers teach, your "level" of yoga ability is unimportant (beginners are welcome). Ashiyana has three main Yoga Shalas all of which are beautiful and well equipped. You are free to attend any of the other Ashiyana activities during your yoga holiday in Goa - meditation, chanting, karma yoga, walks, and impromptu gatherings and workshops. Though we do encourage you to rest and hang out in the peace and quiet of Ashiyana in one of the many chill-out spaces, or bask in the sunshine on the endless stretch of beaches. You will be staying at The Raj Double. The Raj area of Ashiyana is located at the far and of the Palm Grove, and is fronted on two sides by the tranquil Mandrem River. Some of the rooms are within the Ashiyana Villa, which was built on the site of the original (fisherman) owner's storehouse, the others are sited along an inlet of the Mandrem River. We have three (first and second floors of the Ashiyana Villa) magnificent suites with stunning views. All of the Raj rooms are organically-shaped and stone-built, with rustic stucco walls, antique Rajasthani furniture, and sumptuous soft furnishings. No two rooms are the same, each having its individual charm and magnificent view from windows and balcony. During your yoga holiday at Ashiyana Goa, you have one week to relax your body, mind, and soul. It is an inclusive package. With the package, below is what you can also get. Mandrem, a remote and sleepy fishing village in the north of Goa, has a number of restaurants, an internet cafe, a travel agent, a small organic shop, general grocery store and places to rent motorbikes or hire taxis. Thirty minutes away by road is the large market town of Mapusa, which has good coach connections to other Indian towns and cities. A pleasant 40-minute stroll (10 mins by taxi) north along the beach is the lively and colorful village of Arambol. One of the main attractions to this distinctly 'hippy' hangout is the fresh-water lake separated from the sea by broad golden sands and it also has a post office, a small market, restaurants and beach-front bars, some featuring live music. A southward stroll takes you along a quiet stretch of beach dotted with beach shacks and restaurants. Old Portuguese towns around Goa. Ashiyana has been created as a sanctuary, a home away from home. 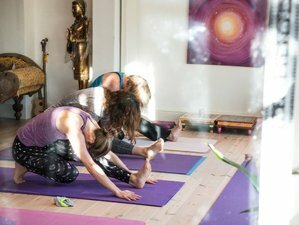 They offer yoga classes, retreats, and teacher training in Goa, India.